Bollywood’s biggest awards ceremony, 64th Filmfare Awards was held on March 23. It was a stunning Saturday with who’s who of the film industry gracing the event in the finest of couture. One such beauty who enthralled us with her breath-taking appearance was Diana Penty. The 33-year-old wore a pink ruffled gown for the awards night. While Diana looked an absolute stunner, her dramatic ensemble reminded us of her Cocktail co-star, Deepika Padukone’s iconic Cannes 2018 outfit – a bespoke Ashi Studio gown! Deepika Padukone, Sara Ali Khan, Mouni Roy, Ayushmann Khurrana - Check Out All The Best Looks From Filmfare 2019's Red Carpet! But let’s first look at what Diana wore to the 2019 Filmfare Awards. From the pictures and details shared by Happy Bhag Jayegi actress on her Instagram handle, the OOTN is from Dolly J Studio. It’s a punch pink one-shoulder ruffle gown. The asymmetrical outfit has a lot of ruffle going on the torso, while leaving Diana’s longs legs on display. The dress has a fair amount of train, nothing too much or too less and working in favour of the gown. Details of Diana's OOTN: Outfit by Dolly J Studio, Hair and Makeup: Avni Rambhia, Styled by Namita Alexander 📸: Enlarge Photography, Managed by Swetha. Coming to the famous hot pink Ashi Studio gown worn by Deepika while attending the Cannes Film Festival last year. The gorgeous actress had become an international sensation with her captivating red-carpet appearance. 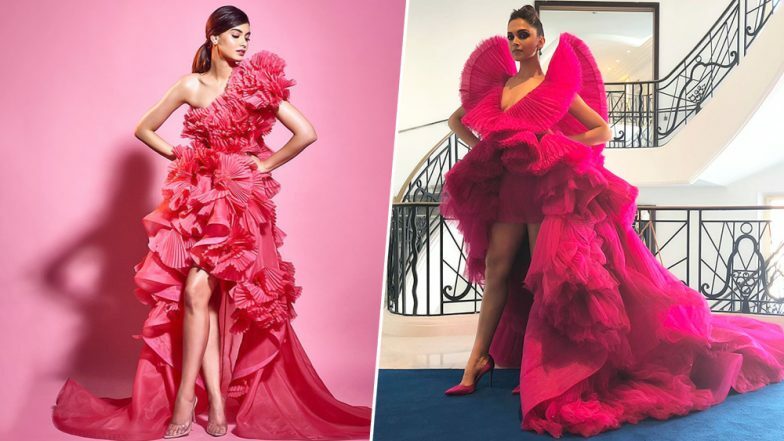 Now, Deepika’s Ashi Studio gown and Diana’s Dolly J Studio gown has a strikingly similar silhouette, and with the ruffles and pink colour are also making it appear each other’s doppelganger. Deepika's stylish Shaleena Nathani shared the details of actress' OOTD. She writes, "@deepikapadukone #cannes2018 wearing the fabulous @ashistudio jewellery @lorraineschwartz shoes @aquazzura makeup @sandhyashekar hair @georgiougabriel @lorealmakeup @lorealskin." We wonder what our favourite Diet Sabya has to say about this situation. While we wait for them to draw a comparison and give out a quirky commentary, we will like to mention how the Ashi Studio gown at Cannes 2018 remains Deepika’s favourite fashion moment. She had admitted this while being interviewed during Vogue’s famous ’73 Questions With.’ In fact, this gown was such a hit that pop-singer Beyonce too wore it on another occasion a previous year. Well, Ashi Studio has really some serious fan following, both from celebs and designers *wink, wink*.